Moorings vs. Private Docks: Should Fees Be Equal? NEWPORT BEACH — When boaters compared the fees paid by mooring owners to the fees paid by residential pier owners during the Newport Beach City Council’s official “look back,” they noticed that the fees paid for the same amount of tideland use were not equal. The “look back,” the city’s attempt to review the Newport Harbor “fair market value” fee implementation process, consisted of two public workshops where city staff members listened to the public’s feedback on how the process is working so far. However, while residential pier owners had a variety of comments about how higher fees are being assessed in an attempt to fairly charge for their use of state tidelands, some mooring holders have questioned the process for determining the fees they pay. According to a sample comparison of a 50-foot mooring to a residential pier in the 200 block of Via Lido Soud — provided in a document shared by Newport Beach resident Patricia Newton at a recent city council meeting, titled “Discriminatory Rates, Benefits & Administration” — by 2017, the fee for a mooring holder will be $2,000 more than the fee for a residential pier owner. According to the report, it would be $3,260 for a mooring with a 750-foot tideland footprint vs. $1,083 for a pier with a 2,063-foot tideland footprint. “For public policy — and under the tidelands trust — the city must compare and assure policies on charges related to the tidelands are fair, reasonable and equitable for all users: This was the purpose of the ‘look back,’” Newton said. “Tideland users using tidelands for the same purpose — boat storage — cannot be treated differently,” Newton said. But the fees — like amenities — of moorings and piers are different because they were derived from different studies, explained Chris Miller, Newport Beach Harbor Resources director. The city’s mooring fees are based on a comparison of rates charged at commercial marinas, while the residential pier permit fees were based on appraisals, Miller said. Residential pier fee payers are property owners who own land adjacent to the tidelands they use, while mooring fees are assessed for city-assigned use of open tidelands administered by the city. Newton said the report pointed out a variety of advantages residential pier owners have over mooring holders, despite the fact that mooring fees are proportionately higher than pier permit fees. Unlike mooring permits that must be renewed annually, residential pier owners can request 5- or 10-year permits. Residential piers can be rented to other boaters by their owners, with no time constraints and with all rental income accruing to the pier permit holder. However, moorings are only allowed to be offered for free third-party use, for a maximum of 60 days — and they can only be used for 30 consecutive days by the third party. Mooring permit transfers to third parties will no longer be allowed after 2020. And those mooring permit transfers that are allowed until 2020 will be subject to a 50 percent transfer fee. There is no similar restriction — or transfer fee — for residential piers, the report stated. Documentation items required by the city for administration of tidelands for moorings are: proof of vessel ownership, name, address, phone number and email address. For residential piers, they are name and address only — with no requirement of information on third-party renters. The city makes an annual income of $80,000 by assigning unoccupied moorings for use as guest moorage, according to the report. The city doesn’t rent out residential piers, which (if it did) could bring an estimated conferred benefit of $128,905 by 2020, the report Newton presented stated. While fees, amenities and advantages differ between piers and moorings, Miller said such comparisons are like comparing apples and oranges. 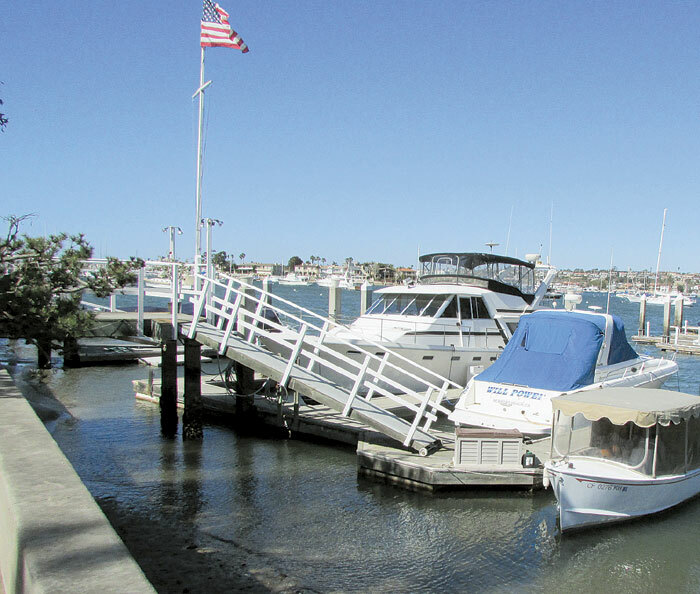 While the fees on one mooring may not break the bank for most boaters, those with multiple moorings will definitely feel the pinch from inequitable fee charges, said Newport Beach resident Jaimie Woodworth, who has five moorings, as well as a residential pier. Woodworth claimed that this year, his mooring fees might be higher than his property tax bill. “I’ve been hearing a lot about the ‘dock tax’ at Newport Beach and, being a boater, it’s a concern to me, because I think it’s one of those made up taxes — just to find a way to take someone’s money from them,” said Dana Point resident and boater Chuck Hornsbee, during the public comment period. “I couldn’t help but notice during an invocation (at the council meeting) that the mayor has been thankful for the wealth that’s been bestowed upon Newport Beach, by making a point that we must be the stewards of wealth — and I think you’ve been bad stewards. That’s why you increased the dock tax? That’s why our Possessory Use tax was increased in Dana Point, because Orange County in general is being bad stewards of their wealth.